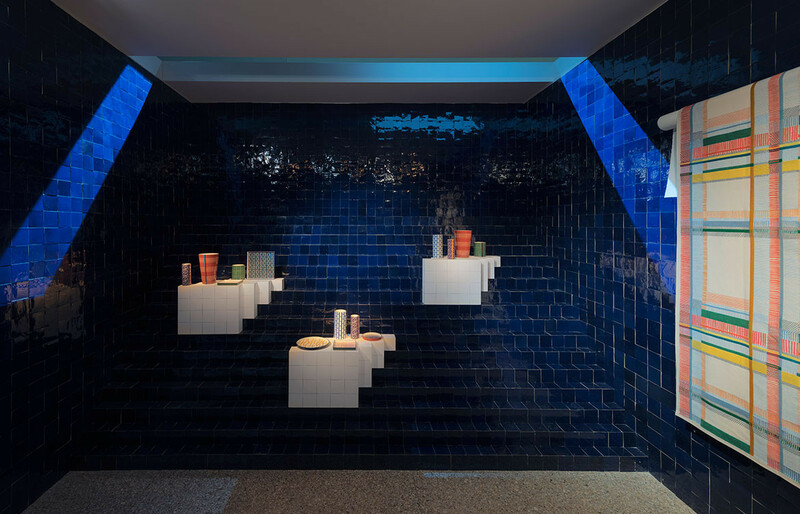 It was fitting that Hermès presented a work of contemplative, dream-like text from artist and poet Jean-Luc Parant alongside its collections for the Home 2018-2019 in Milan this year. 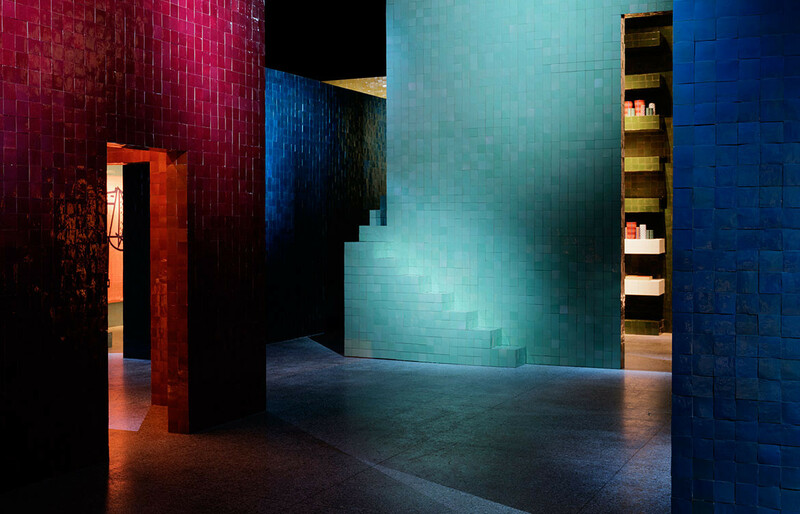 In style, subject and introspective character, Parant’s words were an ideal accompaniment to the objects and the pavilion in which they were presented – a cluster of pavilions, in fact, which absorbed and immersed you in overlapping microcosms­ of colour, light and reflection. Colour is the overriding theme of this year’s collections, which consist of vases, trays, boxes, furniture, textiles, wallpapers and items for the table. 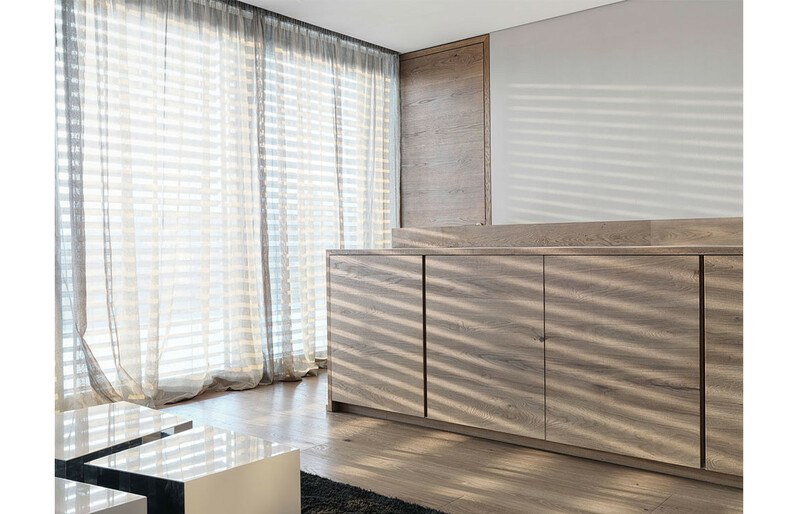 Blues, reds, yellows and greens – and mixtures thereof – resonate from surfaces in designs drawn from elements from the urban and natural landscapes: bricks, louvres, lattices, mosaics, twigs, leaves, grasses, bark and fruit. 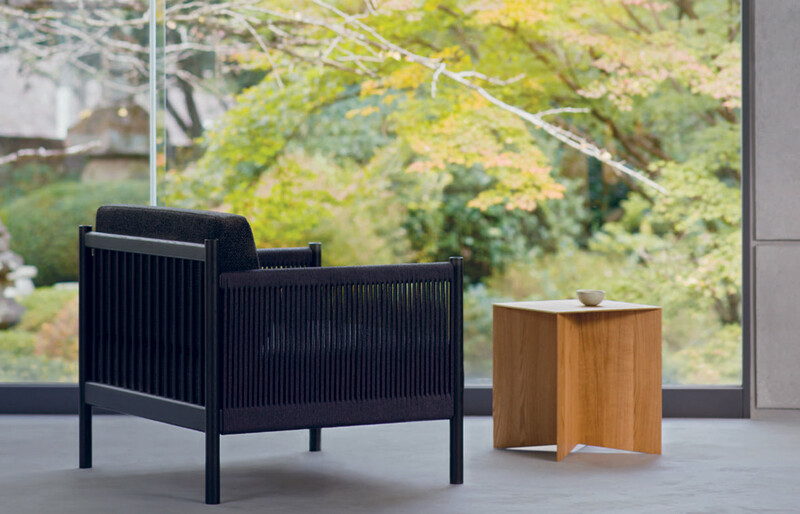 Bright and vibrant colour renditions on lacquer, porcelain and textiles are balanced with denser and more matte expressions on leather and wood. 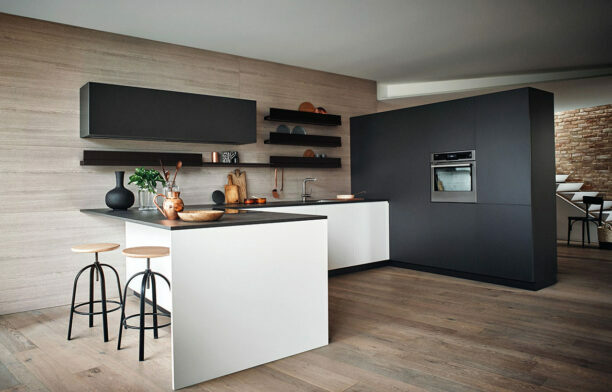 The mixing of colours with each other and with the materials they adorn presents colour as part of the language that composes objects, and that punctuates the home – the basis of another story that an object can tell atop the stories of form, motif and material. 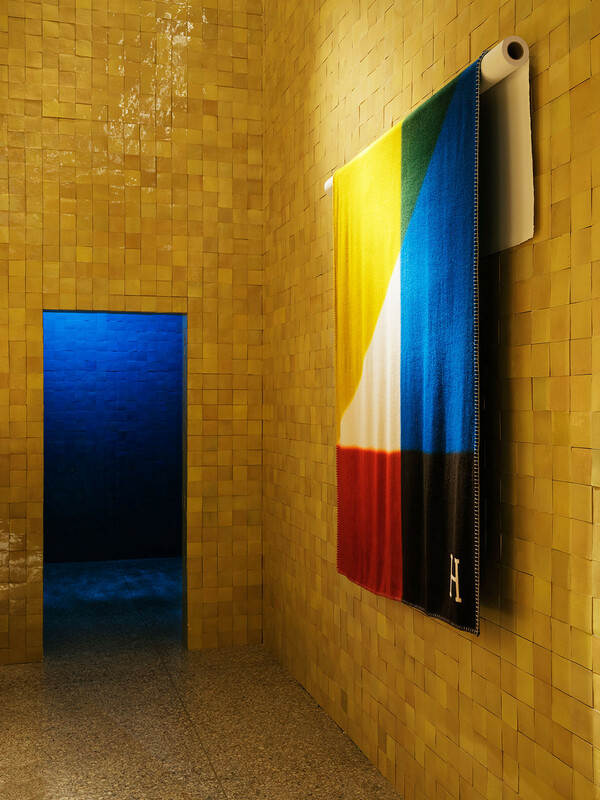 The cashmere plaid Avalon Tangram, for example (designed by Gianpaolo Pagni and Studio Hermès), painstakingly hands dip-dyed with the overlapping of its blue, red and yellow areas creating shapes in green and brown. The colours bleed not only into each other but also into the cashmere, creating deep, low-resolution edge to each colour zone. The process of the dye penetrating the material can almost be visualised. The effect is that the design seems to come to life. That contemplative mind set is also encouraged by objects such as Attrape-Rêves (Dream Catcher), designed by Attrape-Rêves (Dream Catcher), designed by Guillaume Delvigne, Damian O’Sullivan and Studio Hermès. This circular frame of maple with leather cord defies any familiar function but encourages the contemplation of how it could perform – as a holder for scarves or notes, for example. 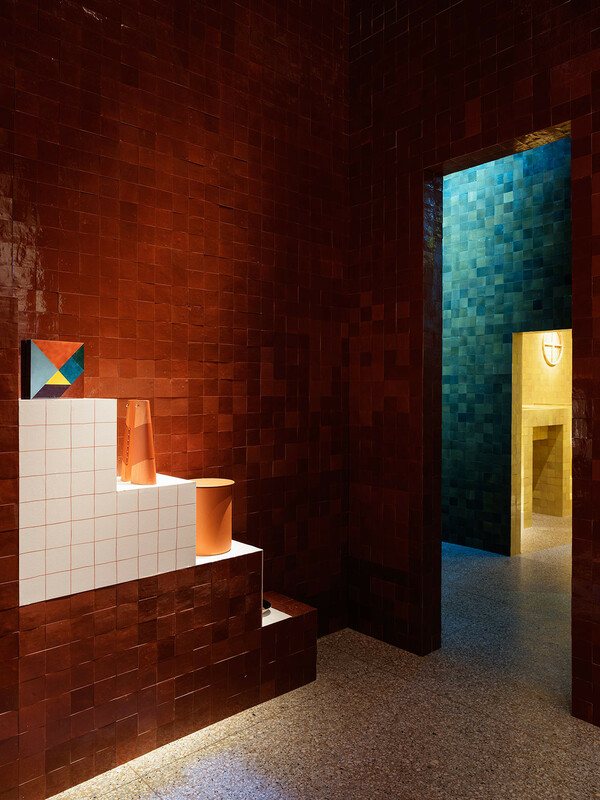 The Hermès Collections for the Home 2018-2019 were unveiled in Milan at the Museo della Permanente in April during Milan Design Week. The presentation, one of the most memorable of the week, captured that contemplative, engaged, dream-like and very personal state of mind with an architecture and scenography that immersed thoughts and bodies. It balanced the colour absorbed by the eyes with the forms engaged with by the body, as Parant described in his text. 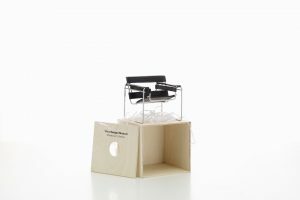 Most critically, it expressed the intimacy at the heart of the Hermes Collections for the Home – an intimacy that comes with finely detailed and crafted objects for the personal environment that will be engaged with as part of daily life over a long period of time. 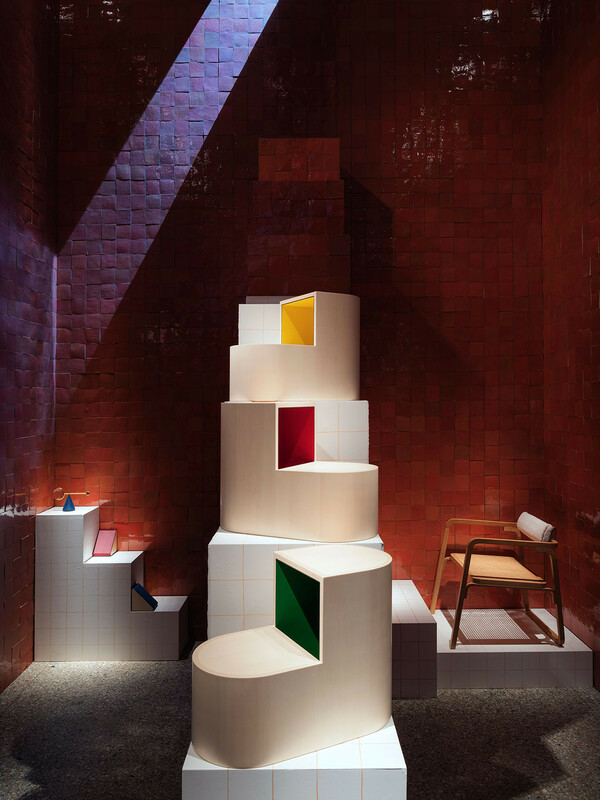 The structure of the installation was designed by Charlotte Macaux Perelman, Deputy Artistic Director for Hermès Maison with Alexis Fabry, and the scenography inside the pavilions was designed by Hervé Sauvage. 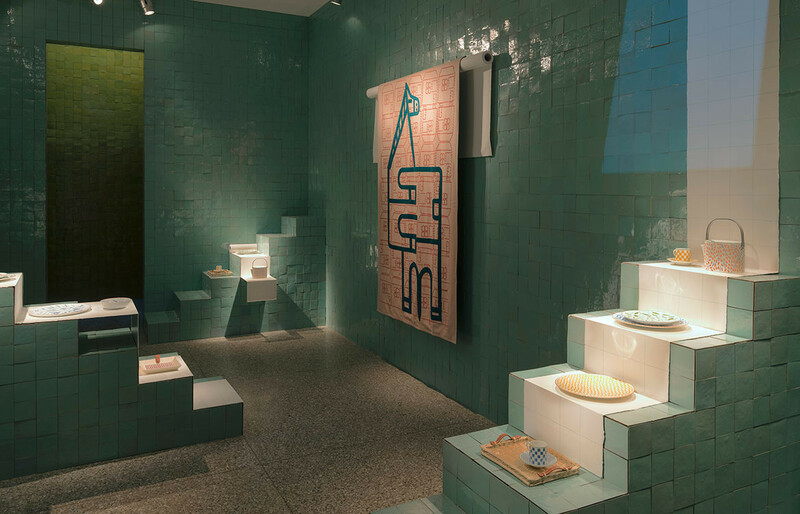 Seven pavilions housed the collection, each of them bearing a skin of handcrafted Moroccan zellige tiles of glazed clay. 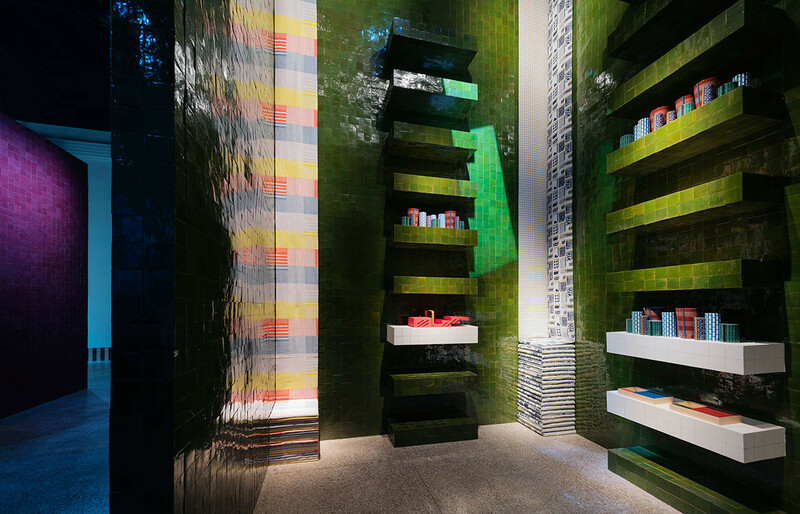 Single colours defined the exterior and exterior of each pavilion, with spotlights and light shafts bringing the undulating tile surfaces to life with shimmering reflections. 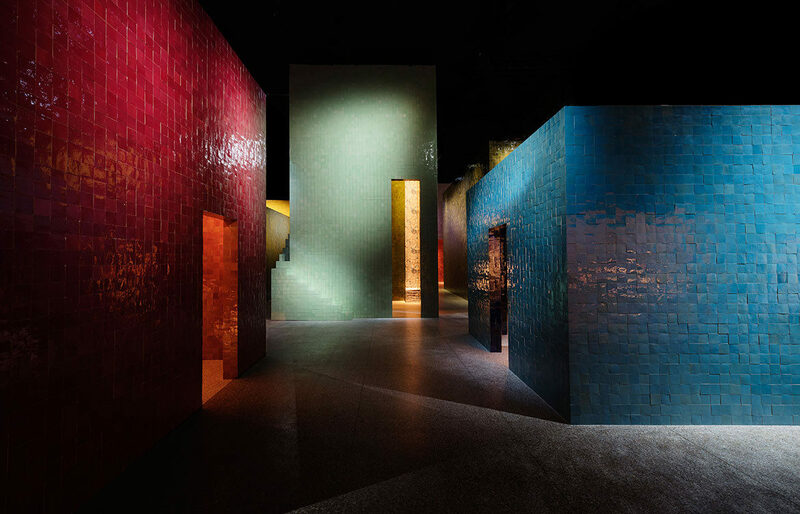 Colours would bleed and blend through the reflections, and perspectival views through the hall would layer colours, exteriors and interiors into a dreamy composition. 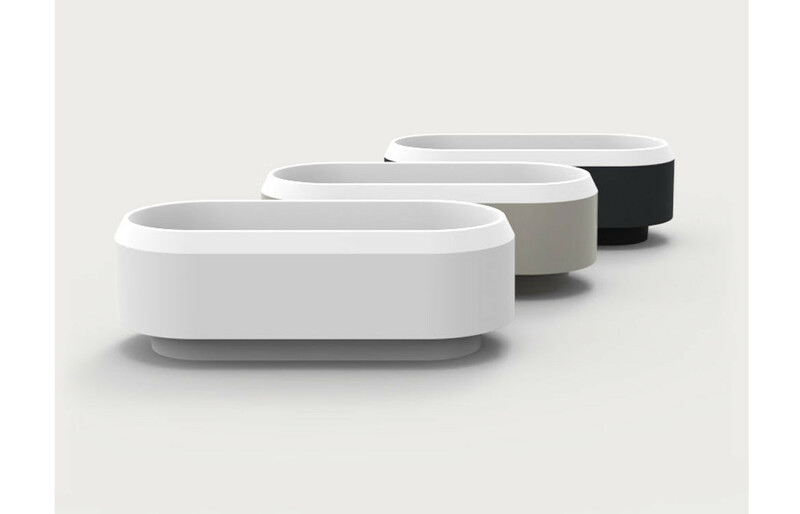 Scale was used to great effect to contrast the monumental architecture with the intimacy and precision of the objects, which were displayed on plinths, steps and shelves. 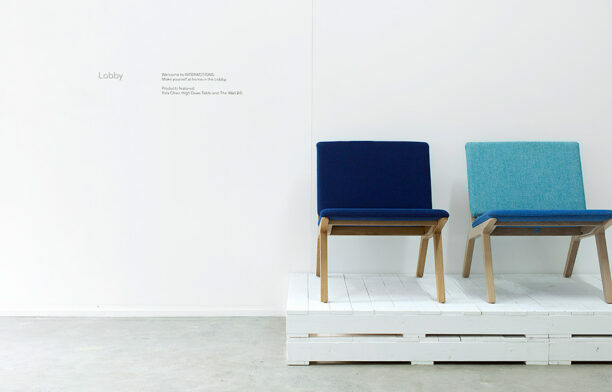 In places, the objects (such as textiles) were presented in deep dialogue with the architecture through reflection and the layering of colour. 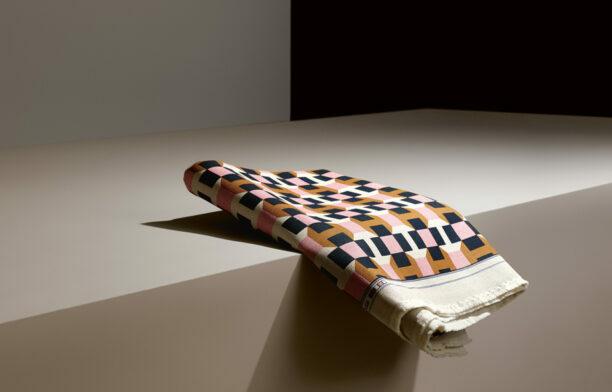 It made for an immersive, sensual and surprising encounter – perfectly Hermès.